[Updated Dec 10] — Hardkernel’s $35 “Odroid-C1” SBC runs Android or Ubuntu on a 1.5GHz quad-core Amlogic SoC, and boasts 1GB RAM plus quasi-RPi-compatible 40-pin expansion. Hardkernel’s community-backed Odroid single-board computer (SBC) project has long been a Samsung Exynos operation, having churned out over a dozen Samsung-based hacker SBCs in recent years. These include the $65 Odroid-U3 based on a quad-core 1.7GHz Exynos 4412 Prime system-on-chip, which earlier this year won third place in our open-spec SBC reader survey. Hardkernel tried out its first non-Samsung processor this summer when it announced the $30, Raspberry Pi-compatible Odroid-W wearables SBC, which uses the same Broadcom BCM2835 SoC as the Pi. A month later, the Odroid project announced it was discontinuing the board due to lack of availability of the BCM2835. According to a Slashdot report at the time, the company canceled the project because it was unable to acquire any more BCM2835 SoCs. Now, the Odroid project is once again setting its sights on Pi users, selling the new Odroid-C1 at the same $35 price and with an almost compatible expansion connector, but with an entirely different processor. The tiny SBC runs Android or Ubuntu Linux on a quad-core, Cortex-A5 Amlogic S805 SoC clocked to 1.5GHz. The SoC integrates the usual Mali-450 GPU found on Allwinner SoCs. The S805 also popped up recently on the Ugoos Android-based S85 media player stick computer. The Odroid-C1 is the first Cortex-A5 based Odroid board, and aside from the short-lived Odroid-W, the cheapest by far. Four Cortex-A5 cores at that speed should be much faster than the RPi’s 700MHz ARM11-based BCM2835, as indicated by the Odroid project’s own benchmarks, which show a 6x advantage over the Pi. On the other hand, just about every board out there is faster than an RPi, which has done little to limit the board’s continuing popularity. A comparison with some other Pi competitors might be more instructive. The Odroid-C1 should be faster than the $50 BeagleBone Black, which has a Cortex-A8-based Sitara. It’s also likely to be a bit faster than the very few other SBCs available in that price range, such as LinkSprite’s $39 pcDuino3Nano, which uses a 1GHz, dual-core, Cortex-A7 based Allwinner A20. Like the Raspberry Pi Model B+, the Odroid-C1 is quite small for an SBC at 85 x 56mm, although it’s not quite as tiny as the 60 x 36mm Odroid-W. The board weighs 40 grams, and runs on 2 to 3 Watts, says the Odroid project. The Odroid-C1 ships with 1GB DDR3 RAM, plus a microSD slot that supports the UHS-1 standard. Its optional 8GB and 16GB UHS-1 cards are said to be accessible at twice the speed of a standard flash card. There’s also an eMMC 4.5 socket for even faster access, with optional eMMC storage modules. The eMMC is stated as an alternative to microSD in one place, but is suggested as an additional optional feature in another. The Odroid-C1 is equipped with a gigabit Ethernet port, four USB 2.0 ports, and a USB OTG and device port. A micro-HDMI out port is provided, along with a serial console connector and an IR receiver. Whereas the Odroid-W aped the Raspberry Pi Model B’s 26-pin expansion connector, the Odroid-C1 uses a 40-pin connector, just like the Raspberry Pi Model B+. This time around, however, the project is not making a big deal about Pi compatibility, perhaps due to widespread complaints from the Pi community over the short-lived Odroid-W. Yet, the C1’s connector does appear to be fairly compatible, as it uses the Raspberry Pi-compatible, open source WiringPi library for C/C++ or Python developers. The project notes that only pins 37, 38, and 40 are not compatible with the Pi B+, as they are dedicated for analog inputs. The board is available with a number of options including USB-based WiFi and camera dongles. There’s also a $16 Tinkering Kit option. Other features – LEDs; IR receiver; RTC; optional USB-based 720p camera; optional WiFi USB dongle; optional $16 Tinkering Kit with breadboard etc. Four videos about the Odroid-C1 SBC that Hardkernel has posted on YouTube appear below. The Odroid-C1 is available for $35 and will ship later this month. More information may be found at the Odroid-C1 product page, and on the Odroid-C1 wiki page. I’d like to see those, too. This is a quad-core A5 1.5 GHz (better compatibility with Raspberry Pi), while the Banana Pi is a dual-core A7 1 GHz. The Banana Pro looks amazing, too, and even has SATA. Why is it so hard for these manufacturers to understand consumers want POE (POWER OVER ETHERNET) ? I don’t want wall warts all over my home/business. I simply want to run a single network cable from my POE switch and have a single UPS (battery backup) powering the whole project. PS: I don’t want to pay $25 per board for a POE de/injector, but I would gladly pay $25 extra to get POE onboard! POE injectors/splitters can be easily found at a fraction of that cost (about $5) on ebay and other online sources. I agree having one on board would be handy though. 100% agree. I’ve got the POE switch for another project. Think of it as the modern version of a 120V power strip. It has the BIG wall wart, that powers 8 RJ45’s along with the usual 1GBS 8 port dumb switch. I am wondering if it’s possible to load OS from a USB port somehow. Does anyone know ? The faster processor is badly needed, but to be clear, the $35 Raspberry Pi isn’t actually $35. 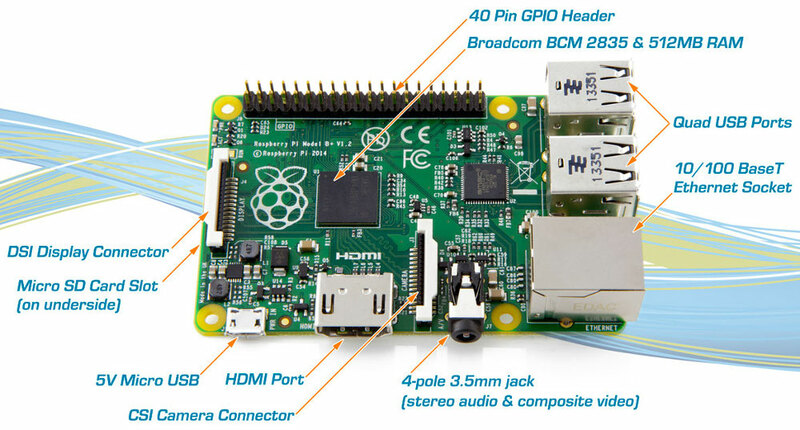 Just checked locally and the price at local retailers is now $48.95 for just the Pi itself. Similarly, this board is more like $50 …. shipping anything from the U.S. is prohibitively expensive. Please correct me if wrong, but the RPi model B+ lost its composite video out. The comparison table shows it as still having it. When will these be available for purchase ? I received my Odroid-C1 on Dec 26th from AmeriDroid.com (distributer for HardKernel.com in the US and Canada). I’m impressed with the boot time using the 16 GB Ubuntu eMMC module. To date I haven’t stressed the machine extremely hard, biggest thing has been installing Samba and Kerberos, which completed quickly as compared to installs on SD based storage. The next thing to install will be BOINC and run some projects. Hey guys, anyone know if this system has an windows O/S installed on it or do we have to install it?